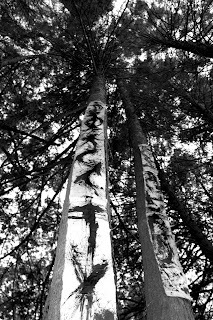 Translations II: Living Sanctuary, a collaborative installation with art students from Walpole High School, was installed at Moose Hill Audubon Sanctuary in Sharon, MA in September 2006. Over the summer I had read a review of the Burning Man arts festival by Anthony Haden-Guest in Art in America in which he contrasted its "therapeutic culture of creativity" with the Darwinist art world. Thinking about Burning Man's open and participatory nature led me to wonder if it was necessary for me to do the drawings for another Translations installation or whether I could offer the "therapeutic culture of creativity" to others. The opportunity came when I received notice of a call for entries for an exhibition entitled "Trees: Unfolding Visions" at the Moose Hill. I boldly called and described my project. Not only was the coordinator Jan Goba interested, she knew of an art teacher in neighboring Walpole who liked doing extracurricular projects with her students. I went for a preliminary visit to meet Jan and choose a space. I was looking for hemlock trees and was thrilled to find a grouping along a stone wall and directly in front of the Visitor's Center. It all came together quickly, so quickly that I wasn't able to have the students help me with the entire project. I did all the grunt work of constructing the banners and because of my schedule it involved one long and painful day on the sewing machine (an advancement over the original Maudslay piece which was all stitched by hand). The kids did the drawings and helped with the installation. My concern was whether they would understand my intention–to make drawings that take their inspiration from the inner spirit of the trees and are about feelings rather than images or symbols. I was very pleased with the results and they seemed to get something out of the process. I hope to be able to do more installations with enough time to involve participants in the entire process.